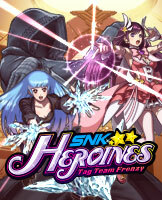 SNK HEROINES ~Tag Team Frenzy~ | NIS America, Inc.
A brand new tag battle action fighting game is here! Players can participate in a four-multiplayer frenzy online or with friends! An Iconic Cast of SNK’s Female Characters! Choose from a generous roster of female heroines from the SNK universe! Coordination is key, as players can choose from up to 100 different accessories for their characters. Accessories including cat ears, glasses, face paint, and new sound effects. ©SNK CORPORATION ALL RIGHTS RESERVED. Licensed to and published by NIS America, Inc.